Four young girls spent a recent Sunday afternoon raising money and awareness for local wildlife. Leslie Foxworthy, Dulse Foxworthy, Addison Miller and Tiffany Foxworthy decided to set up a lemonade stand on Little Gasparilla Island on a warm and humid afternoon … but not to earn money for themselves. Later that afternoon, the girls appeared at the door of Lori Charette’s home on Little Gasparilla Island, holding a jar full of dollar bills and some change: $49 and five cents, to be exact. Lori is a volunteer with the Wildlife Center of Venice. Ashley Foxworthy, mom of Leslie, Dulse and Tiffany, said this is the first time the girls have done anything like this before. Addison, 9, Dulse, 9, and Tiffany, 9, are all going into fourth grade in the fall. Leslie, 7, will be going into second grade. 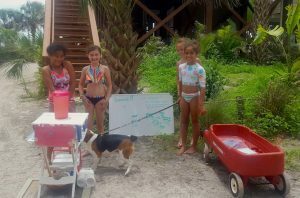 The girls said they are planning another lemonade sale fundraiser for local wildlife around the 4th of July, so look for them if you’re on Little Gasparilla Island during the next couple of weeks. They plan to again donate all the money they raise to the Wildlife Center of Venice.